Desk Report: The United Nations (UN) will raise the issue of Pakistani genocide in Bangladesh in 1971 in the international forum, visiting UN Under Secretary General and Special Advisor on Prevention of Genocide Adama Dieng said. 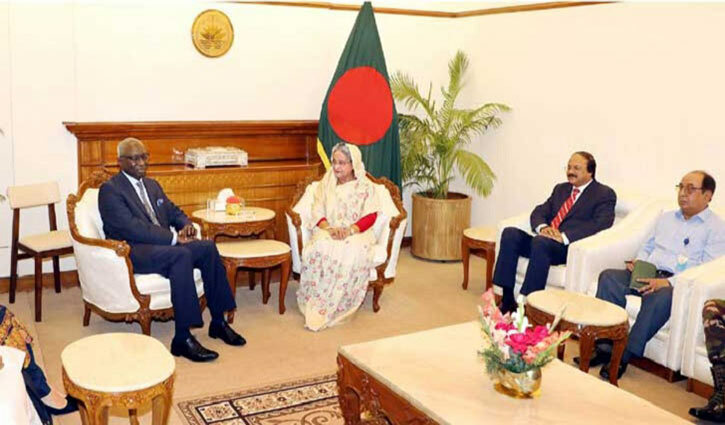 “Though some countries may oppose, we will raise the issue of Pakistani genocide in Bangladesh during the liberation war in the international forum,” he said while paying a courtesy call on Prime Minister Sheikh Hasina at her office on Sunday morning. The premier recalled that the Pakistani occupation forces launched the genocide in Bangladesh on March 25 in 1971. “Over three million people were killed and two lakh mothers and sisters violated by the Pakistani occupation forces and their local collaborators,” she said. In this regard, Sheikh Hasina said Father of the Nation Bangabandhu Sheikh Mujibur Rahman rehabilitated the mothers and sisters who were violated during the liberation war. The press secretary said the prime minister and the UN under secretary general discussed the Rohingya issue. He said Adama Dieng described the Myanmar’s atrocities on the Rohingyas as a genocide and renewed the UN’s strong support to Bangladesh on the issue. “The perpetrators of the genocide must be brought to justice,” Adama Dieng said. The UN under secretary general urged the international community to put more pressure on Myanmar to bring back its nationals from Bangladesh. “Bangladesh cannot solve the (Rohingya) problem alone and the international community should mount more pressure on Myanmar to solve it,” he said. Adama Dieng said the UN wants repatriation of the Rohingyas to their homeland of Rakhaine state, and a peaceful and inclusive society builds up there. The UN under secretary general highly praised Prime Minister Sheikh Hasina for giving shelter to over one million Rohingyas in Bangladesh. “You’ve opened the door widely for the Rohingyas,” he said. In this connection, the prime minister said the Rohingyas outnumbered the local people of Cox’s Bazar. “As a result, the local people are suffering a lot,” she said. Highlighting various steps for the welfare of the Rohingyas, Sheikh Hasina said the government is developing an island named Bhashanchar for their temporary shelter. The prime minister thanked the international community for extending their helping hand on the Rohingya issue. While talking about the issue of terrorism and militancy, she said few incidents took place in the country, but the government tackled those in iron hand. The prime minister said the government is exchanging views with the cross section of people including teachers, students, public representatives, religious leaders to create mass awareness against the menace of terrorism and militancy. Adama Dieng mentioned outstanding leadership of three female leaders in the world, stating the name of Bangladesh Prime Minister Sheikh Hasina, German Chancellor Angela Markel and New Zealand Premier Jacinda Ardern, the press secretary said. He said the UN under secretary general highly praised Prime Minister Sheikh Hasina for ensuring women empowerment in the country. “You’re a symbol of women empowerment,” the press secretary quoted Adama Dieng as telling the premier. The UN under secretary general hoped that Bangladesh will achieve sustainable development goals like MDGs under the leadership of Prime Minister Sheikh Hasina. Adama Dieng also remembered Father of the Nation Bangabandhu Sheikh Mujibur Rahman terming him as a man of peace.